The Cisco 7606-S Router is a compact, high-performance router designed in a 6-slot form factor for deployment at the network edge, where robust performance and IP/Multi-protocol Label Switching (MPLS) services are necessary to meet the requirements of both enterprises and service providers. It enables Carrier Ethernet service providers to deploy an advanced network infrastructure that supports a range of IP video and triple-play (voice, video, and data) system applications in both the residential and business services markets. 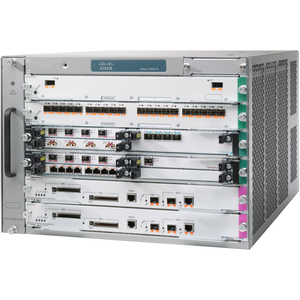 The Cisco 7606-S also delivers WAN and metropolitan-area network (MAN) networking solutions at the enterprise edge.